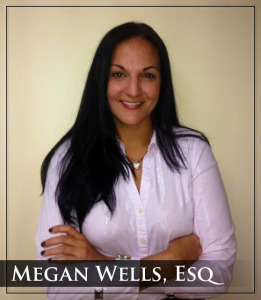 Attorney Megan Wells’ legal career focuses primarily on family law, domestic violence and civil litigation. She obtained her Bachelor of Arts degree in Public Communications, with a double minor in Women’s Studies and Ethnic Studies, from Florida Atlantic University where she graduated with honors. Megan then attended St. Thomas University School of Law, where she obtained her Juris Doctorate Degree and was a member of the Intercultural Human Rights Law Review, the President of the Caribbean Law Students Association, and Treasurer for the St. Thomas School of Law’s chapter of the Florida Association of Women Lawyers. During law school Megan worked as an intern at Legal Services of Greater Miami, Inc. (“LSGMI”) where she assisted clients in the Foster Youth Legal Services Project and the Disability Law Project. She was instrumental in helping foster youth who had aged out of the foster system with potential legal issues, and assisted disabled children in obtaining or continuing to receive state benefits. Megan also worked with LSGMI attorneys on a variety of programs designed to help lower-income households. In her third year of law school, Megan continued her commitment to public service by working as an intern for the Miami Dade County Legal Aid Society. While working with Legal Aid, she assisted family law attorneys in preparations for mediations, uncontested and contested family law hearings, and prepared cases for trial. In 2012, Megan began her law career as an associate attorney at a boutique law firm handling family law, foreclosure defense, personal injury, and business litigation cases. In early 2013, Ms. Wells opened Wells Law Firm. Wells Law Firm is focused on family law practice areas such as divorce, child support, alimony, paternity, custody, domestic violence, and all other issues related to children and families. Ms. Wells is focused on conforming her representation to meet each client’s individual and changing needs, while legally guiding them through what may be the most difficult time in their lives. Please contact our office today for more information.